Being a dietitian, most of my discussions are around food— all day!! Which always makes me remember flavors that I may have been missing out on. Today, my client brought up Zoe’s kitchen and automatically I thought of falafels and their salmon kabobs. Proud to say both my clients picked the roasted veggies, salmon kabobs, and they also got a cookie. Ok the cookie may not be the best choice. But, I encourage my clients to keep all foods within their nutrition plan and practice control and portions. My one client stated she would have eaten the whole cookie and now is able to eat a piece and put it away (Woohooo). When we eliminate food from our nutrition plan, we are more likely to over eat it (or another item) later on. I just say have a piece and put it away for another day..make that baby last a few days (plus saving you money!). In the summer I found my love for falafels. I never had them before. One night we went to Bok Bar in Philadelphia (it is closed now due to the summer being over) and they were serving Mediterranean food. I had falafels in a gyro and my life changed! A few months later, I went to Zoe’s Kitchen and again had falafels on the side of some kabobs. Since I loved them so much, I figured why not make my own and bake them instead of frying them? So I did just that. After researching, they said to use dry chickpeas and soak them to prevent a crumbly falafel. To be honest, I always forget to do it, so a can is much easier for me. Yes, they were crumbly but in a bowl I break it up anyway, so no worries on my end. This tazaiki sauce is made with almond milk yogurt (by Silk), whether you have a milk allergy or going vegan this yogurt is delicious. Plain Greek yogurt would be a great choice as well. I can’t wait to make these again and hope you enjoy as well! Preheat oven to 375 degrees F and grease a baking sheet or use stone. In a food processor, blend all ingredients together, and scraping the sides. Make sure to not over process. Form into balls (about 1.5 inch), slightly flatten into a patty, place on tray, and spray with olive oil or brush with olive oil. Bake for 20 minutes, flip and bake for another 10 minutes until brown. Remove and let cool before enjoying in pita or in a salad. * Dried chickpeas are better to prevent them from falling apart, but I didn’t have them on hand nor the time! It is best when sitting in the fridge for 30 minutes or more. 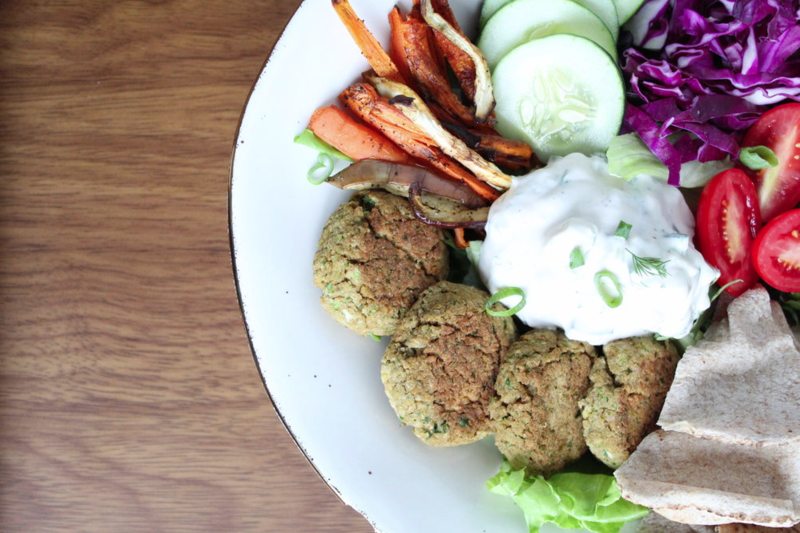 Included: roasted carrots and eggplant, spring mix, cucumber, red cabbage, grape tomatoes, whole wheat pita, falafel, and tzatziki sauce…DELICIOUS!